At Prokil, our preferred method for waterproofing a basement or partially below ground structures is a ‘Type C’ cavity drainage system. Using this system creates a habitable environment. Traditional tanking (‘Type A’) systems usually work by holding back the hydrostatic water pressure with cement renders, slurry, resins, bitumen based products, spray-on systems and bonded sheets. This method can be both messy and problematic for properties. Over time, the water pressure can cause pressure levels to build-up on the structure of the property. This could eventually cause any defect or weak point which can result in catastrophic failure and significant damage to your property. A ‘Type C’ cavity drain system is a far more effective modern solution to your waterproofing needs, and works by diverting and managing any water penetration or seepage. 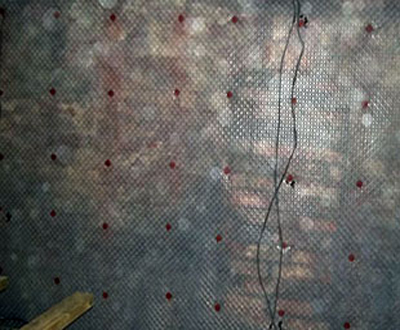 A cavity drain system uses a specialist studded plastic membrane which is secured to the walls and floor. This allows any water to be diverted into a perimeter drain which can then be discharged from the property via a suitable drainage point or sump and pump. This durable and robust system allows a multitude of internal options such as wall finishes which can be either free-standing dry lined metal frames or plasterboard direct applied to membrane. Our surveyors have been trained to Certificated Surveyors in Structural Waterproofing (CSSW) Level and work to produce solutions that comply with BS 8102:2009 Code of Practice for protection of below-ground structures against water from the ground. All installations that comply with BS8102 carry a 15 year basement waterproofing guarantee. For a professional solution to these problems and more contact Prokil today for a no-obligation quote. If you do want to convert your basement into living space, make sure you plan ahead and review every aspect carefully.